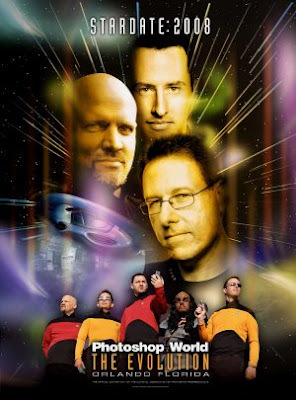 Well boys and girls, I'm heading down to the Mandalay Bay Convention Hall to attend the Keynote Address and other entertainment by Scott Kelby and his crew of Photoshop Instructors. I've been looking forward to this convention for several months now because it is a fun place to learn a very difficult graphic program... Photoshop CS3. I get a good bang for my bucks because for $399 I get 3 days full of instructions from the nation's best instructors. Can't beat that! Stay tune, I will update what I learn from some of the classes this week. By the way, you can download your own hi-res version of the poster above by clicking here.